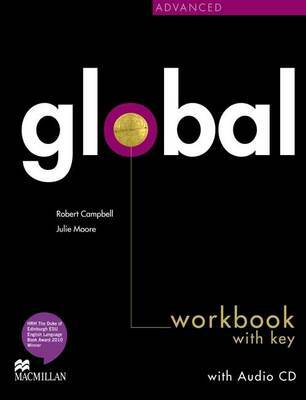 The Global eWorkbook represents an evolution in self-study materials for students. Within a rich multimedia environment it provides a wealth of resources for the learner, enabling them to continue their studies at their own pace, and in their own time. Interactive Practice The eWorkbook contains a wide range of activities which allow for extra practice and review of the language presented in the Coursebooks. Print and Work Learners can print out worksheets and use them for revision or practice as they would with a traditional printed workbook. On-the-go Study We have provided a wide variety of extra listening and video materials in the eWorkbook. These are supplied in commonly used file formats, so students can load these materials onto their portable music and video players and study and review 'on-the-go'. SCORM Content All of the content in the Global eWorkbook is fully SCORM compliant. Activities can be supplied for integration into your institutional Learning Management System (LMS) or Virtual Learning Environment (VLE). If you are interested in using Global eWorkbook content in your LMS, please contact your local Macmillan representative.